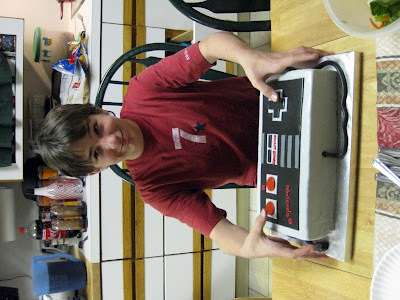 This cake was made on the fly (we had been home an hour from snowboarding in Colorado when we started it) for my youngest brother Matthew, for his 15th birthday. 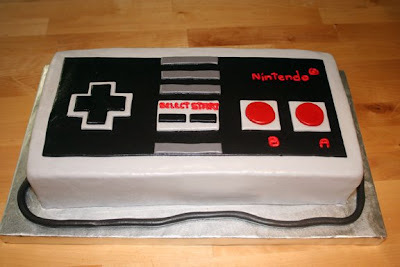 Last year I made him the Wii cake, this year he gets classic NES! It's 1/4 sheet cut down (french vanilla) with strawberry buttercream covered in marshmallow fondant. Rodney did so much work on this cake (I had the flu the entire time we were in Colorado), if it hadn't been for his help, I don't believe there would have been a cake! All of the details are fondant, with the exception of the words, which were piped on by me! I think Matthew is so bloody lucky!